CERRO DE PASCO, Peru, Jan 5 2009 (IPS) - An immense open-pit mine located 4380 metres above sea level is swallowing up the centre of the city of Cerro de Pasco in Peru’s central highlands, while the damages, in the form of toxic waste, spread to nearby villages. Naún and his friends dream of living elsewhere. Credit: Milagros Salazar/IPS. The government just signed a new law to relocate part of the local population, who for decades have suffered from the lead dust, dynamite explosions and toxic gases generated by the mining of zinc, lead and silver. The open-pit mine now operated by Volcan, a Peruvian company, in this city of 70,000 – which is the capital of the province of Pasco – is now 1.8 kilometres long. Neighbourhoods stretch all around its edges. The shabby houses located a few metres from the edge show cracks from the detonations, and children with blood lead levels far above the acceptable limits play next to vast heaps of slag. And in villages near the city, local peasant farmers watch their livestock die because of a lack of water, and contaminated grass. The Civil Defence Institute concluded in 2006 that 85 percent of the housing around the mine is uninhabitable. Local residents are aware that they will have to leave their homes, although that day has taken a long time to arrive because the relocation project has been postponed for years. But since they know they won’t be staying, any future plans are put on hold. “Is it true? The president approved the relocation? That would be good for the kids. But who will be covering the costs of the resettlement?” 19-year-old Carolina Berrospi, who lives next to a mountain of mining rubble in the neighbourhood of Ayapoto, asks IPS. The new law gives the government a mid-January deadline to set up an inter-institutional committee that will carry out technical studies for the relocation, finally marking the start of the resettlement of 11,000 families. The most heavily affected areas are the neighbourhoods that surround the mine, which Volcan has operated since 1999, or outlying areas where mining companies have dumped waste for decades. The activities of the mining industry date back four centuries in this chilly highlands area. They intensified in 1901, when the U.S.-based Cerro de Pasco Copper Corporation moved in, and continued under the state-run Empresa Minera del Centro del Perú (Centromín) in the 1970s. Volcan has been mining in the area since 1999, mainly for zinc, lead and silver. The widespread suspicions of health effects caused by pollution have been confirmed. A 2005 study by the Pasco regional health agency found that more than 80 percent of children in the communities of Quiulacocha and Champamarca had blood lead levels exceeding 10 micrograms per decilitre of blood (mcg/dl), the acceptable limit set by the World Health Organisation (WHO). In 2006, similar results were found in Yanacancha. Chronic lead poisoning can cause irreversible neurological damage, renal disease, damages to the reproductive system, anemia, high blood pressure and cardiovascular problems. In children, it stunts growth, causes learning difficulties and behavioral problems, and can lead to mental retardation. High concentrations of lead can cause convulsions, a state of coma, and even death. 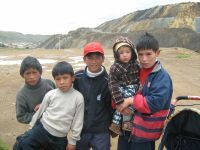 A May 2007 report by the U.S. Centres for Disease Prevention and Control (CDC) provided the results of testing of the soil and air in 40 public areas and 53 homes in the communities of Ayapoto, Chaupimarca and Paragsha and of examinations of 357 local residents: 163 children and 194 women. According to the report, 91 percent of the children between the ages of one and 12 and 82 percent of the women of childbearing age who were studied had high blood levels of toxic substances like lead, cesium and thallium. On Christmas Day, three boys, Juan José, Naún and Christian, are taking little one-year-old Shandé for a walk. As soon as they hear the click of IPS’s camera, they approach and pose with a smile in front of a mining waste dump in Ayapoto. “I don’t like living here, there’s so much garbage, and when the explosions come, it smells,” says Naún, who explains that he has a blood lead level of 18 mcg/dl. The detonations shake the houses at scheduled times: 11:00 AM and 3:00 PM. “It’s the ‘shots’ that fill the air with a smell like burning rubber,” says local resident Vilma Vicente. “When that happens, my little brother shouts and cries,” says 11-year-old Angela, who is all dressed in pink. The most heavily affected rural community is Quiulacocha, whose 850 inhabitants try to make a living by raising sheep. But the village is hemmed in by waste dumps that hold a toxic mixture of refuse material from the mines. The first, containing the waste left by Centromín, is at the entrance to the village, where there used to be a small lake. A bit farther down the hillside is Volcan’s Ocroyoc tailings dam. “It’s terrible, especially in the summertime, when the tailings ponds heat up and the wind blows a harmful steam into our houses,” the local mayor, Silvino Guadalupe Rojas, tells IPS. Alberto Rojas, a local resident who owns 200 head of cattle, says that in 2008 he lost up to 25 percent of his animals as a result of drought and polluted grasslands. Pasco Governor Félix Rivera told IPS that the relocation will take between 15 and 20 years, and that the first stage of the project alone will cost 1.5 billion dollars. “Twenty years? I’ll be dead by then. Since I was a boy I’ve heard that we’re leaving, but nothing ever happens. Look at the corrugated iron roofs, they’re black from the mining dust,” says Alberto Rojas, whose son has a blood lead level of 17 mcg/dl. Volcan plans to expand its mining operations through what it calls “Plan L”, which is to entail the destruction of an 11.4-hectare area in the old city, in the neighbourhood of Chaupimarca. The parade ground, main church and historical Vicente Vegas building where Pasco’s independence was declared in 1820 will all have to be demolished. The company is trying to get at the minerals under that area, where it has already bought up around 400 homes. The project is covered by an agreement signed with the municipal government in September 2008. The head of public relations for Volcan’s Cerro de Pasco operating unit, Luis Pariona, told IPS that the company respects the new law on the relocation of the city, but that it will not bring Plan L to a halt, because the local authorities and social organisations approved it after holding nearly two dozen public hearings, which reached the conclusion that mining activity in the area is a public necessity. But Rodolfo Rojas, the delegate representing local merchants and residents of Cerro de Pasco in the subcommittee on the expansion of the mine, said that only five of the 14 members of that group actually signed the final report approving the expansion of the company’s activities. “The expansion of the mine must be suspended until a fair plan for the relocation of everyone to a healthy place is guaranteed,” Rojas, a high school teacher, argued. Volcan is proposing a shorter-term resettlement plan that would involve the construction of housing and public institutions in an area not far from the mine, he said. Dimas Peña, president of the association of local merchants and residents of Cerro de Pasco affected by the expansion of the mine, is seeking facilities so that people who live in the old city can purchase land, under a decree-law approved in 1971 for the relocation of part of the city. “This situation reveals the absence of the state in the model of the mining enclave where the company has control over the social, political and economic life,” Congresswoman Gloria Ramos, whose father was a miner and who is herself from Cerro de Pasco, told IPS. “For years the right to work has been granted in exchange for a life marked by pollution and poor living conditions. We have grown up with a culture of short-term profits that has ignored sustainable development,” said the legislator. In some areas, local residents receive murky water for only a few hours a day, three times a week, to cover all of their needs. In his conversation with IPS, Pariona acknowledged the serious pollution problem, but blamed it mainly on the past. “The soils in Cerro de Pasco themselves are contaminated with lead and all of the metals found in this area. For over 400 years, mining operations have generated grave and drastic environmental damages,” said the Volcan spokesman. But like a festering wound, the open-pit mine continues to grow, in the present.